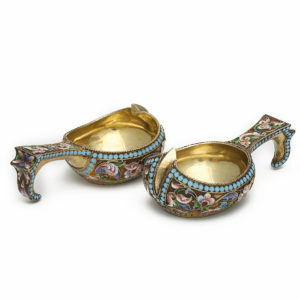 These ornamental ladles are kovshi (singular: kovsh), a type of Russian drinking vessel in the shape of a duck. Traditionally, various vessels were intended for different beverages. Kovshi, which come in a range of sizes, were intended for drinking kvass or beer. They were also used for drinking mead, a honey based drink that varied in flavor from using different fruits and berries. Silver kovshi were used for white mead, while golden kovshi were used for red mead. They were originally made of wood and some early kovshi were made of tightly woven cloth. In the 16th century, they began to be made in silver and increasingly assumed a ceremonial status. The kovshi in our collection are nineteenth and early twentieth century pieces of the Old Russian style, seen in the multicolored enameling inspired by sixteenth and seventeenth-century patterns. A yearning for a Russian art unmarred by Western influence contributed to what became the Russian Revival in the 1870s and 1880s. Interest in exploring early Russian artistic traditions provided craftsmen with a rich body of sources for creating beautiful, distinctly Russian works of art. Cloisonné enameling is but one example; another is trompe l’oeil, discussed in this blog post. While many such pieces were ornamental, a few could function as punch bowls or salts depending on their size. These pieces illustrate how time and again the functional and artistic merits of the decorative arts can be appreciated both independently and harmoniously.